One of my favorite Case pocket knives, the Trapper seems just right for the pocket and the hand with a simple shape that fits the palm securely and two practical blades perfect for every situation. Ron Yellowhorse adds Navajo workmanship and symbolism to these Case Trappers, but includes a few with special meaning for other cultures as well. The knives in this selection are one-of-a-kind and very collectible. The fundamental construction of the knives is what you'd expect from a Case slip-joint Trapper, but the handle slabs aren't the usual materials Case provides. Instead, Ron Yellowhorse adds inlays of rare materials like ivory cut from fossilized mammoth teeth, as well as semi-precious stones. Inlays may include blue and white turquoise, black jet, purple suglite, and green malachite. The knives incorporate standard nickel silver bolsters textured in unique ways through hand-hammering or etching. Folding to 4-1/8 inches, each Trapper holds two blades originally designed for the hunter and woodsman -- spey and clip point. Each knife handle includes a central figure in nickel silver which represents an important animal or bird. Most are clearly from Navajo culture, but Ron Yellowhorse created a few with other traditions in mind. 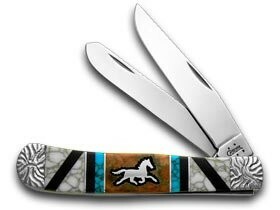 Themes on these unique knives range from the buffalo, roadrunner, and stallion to the jack-o-lantern, poodle, and turkey. Ron and David Yellowhorse produced limited quantities of unique knives and numbered limited editions for Case. Both men are fourth-generation Navajo jewelers and knife makers well-known for their custom creations. See the Josh Buck Gen-5 Skinner for a limited edition collectible from Buck Knives.